PAULDING – Community visits have been scheduled for a small town revitalization expert who is visiting the county for a week. 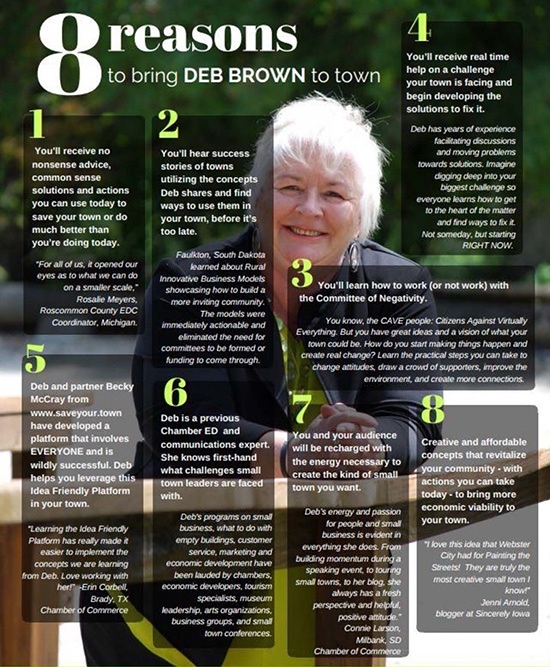 Deb Brown, co-founder of SaveYourTown, will be here April 10-16. She plans to meet with local groups, organizations, government officials, business owners, students and residents. • Village of Antwerp, 1-3 p.m. at Antwerp VFW. Brown is scheduled to attend events in Paulding on Thursday and Friday. In addition, Brown will share her insights at an open public meeting at 6:30 p.m. Monday, April 15 at Branch Christian Fellowship on the east side of the square in Paulding. The focus of this project, made possible by the Great Lakes Rural Community Assistance Program (GLRCAP), is to provide the community with an idea friendly way to move forward and continue to create a thriving town.